I've always said ageing is not for the faint hearted. One has to readjust a few gears and get back on track. Some slip into it easily with plans of adventures and for others, it's a time to reflect on who the person looking back at them in the mirror is. Don't stop too long to find out. Just throw yourself whole heartedly into living and life and follow forgotten passions, or learn new ones. There's a host of activities and events that could put that spring back in your step. The only pre-requisite is that you be open to new adventures and love where you live, be it your city, your county, or in your own skin and headspace. The elite activity would have to be air travel; jetting off wherever you will to any country you want. What a luxury, and even better if you could just live there like a local for a few months, being a traveller, not a tourist. There's a whole world to discover and many cultures to learn about. The choices are endless and the world is your oyster. Just be sure to adhere to travel tips specific to the senior age group, especially if you have disabilities. As far as accommodation goes, would you believe there's even couch surfing for seniors? If your feet are firmly planted on the ground, there's a growing army of Grey Nomads who let their desires drive where they roam. It's all about the great open road and stopping where you love. There's a huge community of nomads that meet on a regular basis at events they hold in every state in Australia. It's a great way to travel if you like being on the road as your timetable is your own. For those who love the water, there's nothing like the lull of a relaxing cruise. However, some would hardly call it a lull as cruise ships offer so much in entertainment. You can always find special senior cruise deals and holidays complete with tips to consider. Use it or lose it is an adage to live by. Keeping active, staying fit and keeping our brain young, healthy and active becomes all the more important in the senior years. Challenge yourself to learn something new; why not try a new language? Australia is dotted with U3A organisations online and in your local state (i.e. Melbourne). Membership is open to people aged 50 plus, are retired and no longer working full-time. At approximately around $35 to $60 for membership (depending on the suburb your U3A is situated) per year, you can choose up to 5 courses to study, each week paying an additional minimal dollar or two to cover the electricity, heating etc. 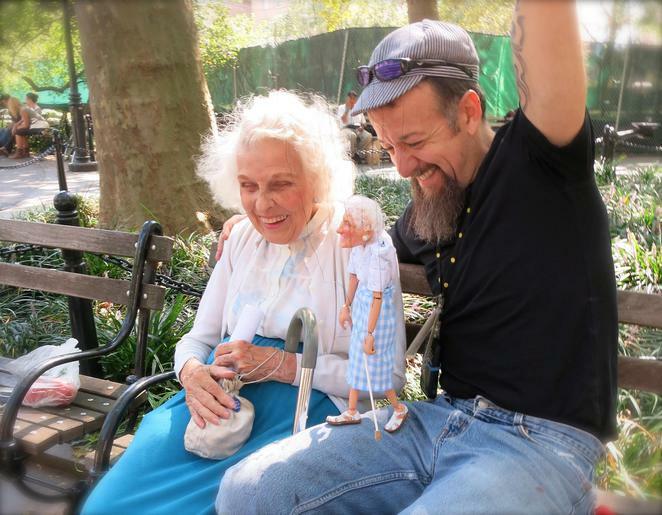 The focus is more on connection, community and being amongst same age like-minded people through which many a new friendship or social connection can be formed. The teachers, lecturers and staff are all same age volunteers, so if you have an expertise in an area, they'd be happy to hear from you if your passion and goal to stay connected is by giving of your time as a lecturer. On the internet, there are also a host of Seniors Services Guides for more ideas on senior activities and of course volunteering, be it at a hospital, an op shop or other services. This is a selfless act to give of your time with rewards going both ways. With a lot of information on the world wide web, it becomes important to become computer literate, and it pays to be computer savvy if we're going to enjoy all the information it has to offer. Local libraries are a great way to start as a lot of them offer lessons to get you started. You can then start browsing age appropriate activities, including government websites like My Aged Care who offer tips and information about services and social activities. Being on the internet is not all bad because sometimes when getting out of the house is impossible, it can be a source of entertainment, connection and a way to pay your bills online without having to worry about getting stamps, envelopes, or driving to the post office. As always, use caution on the internet and know who you're dealing with. Please note that the links to pages I've put in this article is not a recommendation or endorsement. It's simply somewhere to start your exploratory journey on the internet. Living in the fair city of Melbourne where there's always an event happening, there's a host of activities to choose from. Be it going to festivals (film, food, comedy etc), markets, theatre and so much more. There's also a lot of eateries to discover, and other simple activities such as simply heading for the hills or enjoying the beach, dropping by for a coffee on the beach or heading down for fish and chips in Port Melbourne. The local RSL clubs i.e. walking, bowling, darts, badminton, tennis etc. are also a great source of entertainment and activities that keep you mind and body fit. If ever you're stuck for ideas, the Weekend Notes is a good place to start. It's what I do each weekend to find out what's happening on Saturdays and Sundays and then just head out and have an adventurous day. If you're on a government pension or have a Victorian seniors card, your weekend travel is free. Just be sure to have a Seniors MYKI card which is generally provided to you for free when applying for the Victorian Seniors Card. Your Centrelink card for those eligible also comes with an annual train travel voucher to utilise. 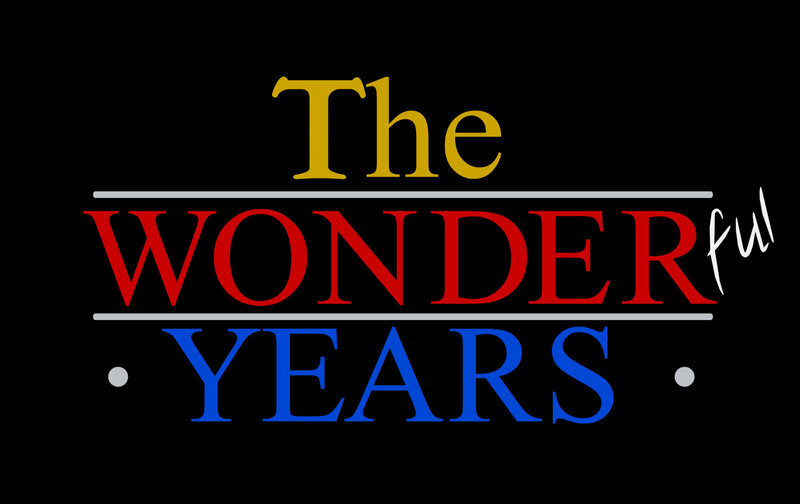 The old Life be In It! slogan stands true. Live life large, because every day is a gift. I hope you're inspired by some of the images I've put up here as they certainly inspire me. Iris Apfel a style icon in her 90s. 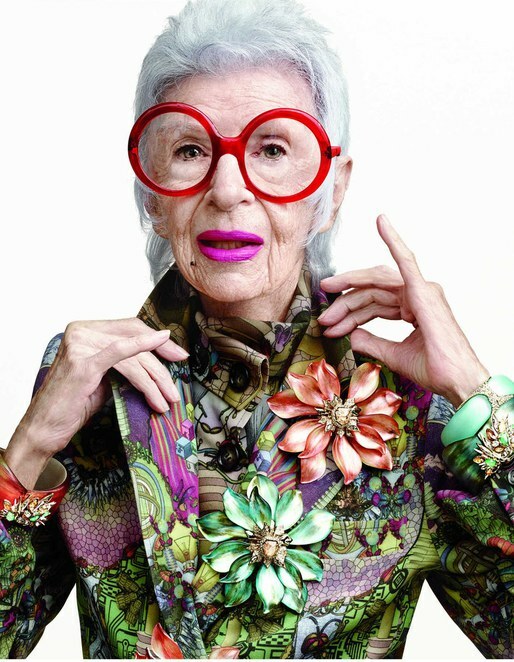 I love that she dares to be individual and outrageous. Doris Diether, still an activist, fighting the fight for her fellow man and not afraid to form new friendships. 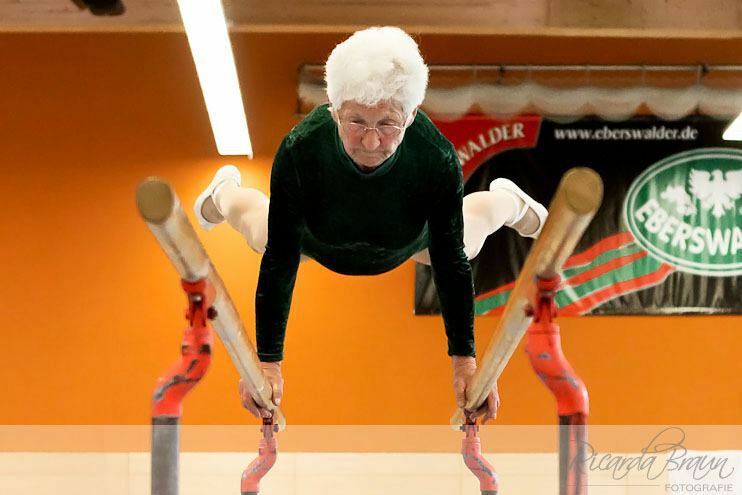 Taking fitness to another level is super gran, German gymnast Johanna Quaas, named the world's oldest gymnast at aged 86 back in 2012. Ricky Syers who let his passion dictate and followed his dreams. 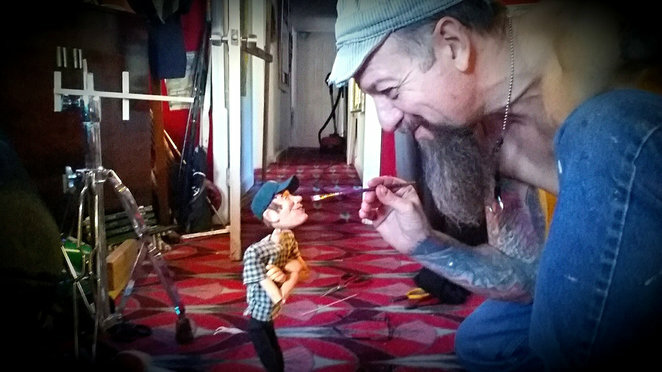 I'm mad about his puppets. 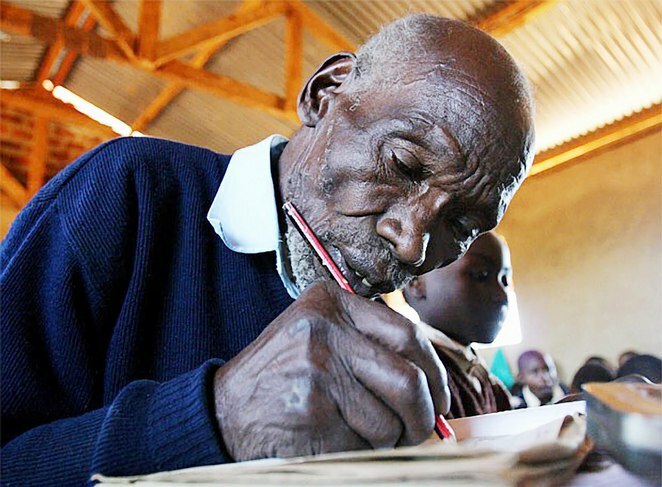 Though there are many more, last but not least, Kimani Maruge, who at 84 years of age, went to primary school for the first time. There's certainly a lot of inspiration to be drawn from, so live passionately! Stay active and dare to do something different. Congratulations on winning a second prize.